Many of you have asked how our friend Stephanie is doing with her battle with AML Leukemia. Well friends, the answer is- not good. Let me back up a little bit: Her bone marrow transplant surgery went so well! Like, SO well! She was out of the hospital a few days earlier than the Dr's expected! I mean, awesome right? Stephanie and her husband Tyler were able to spend Father's day with their little ones (having missed Mother's Day because of the hospital admittance). Praise Jesus! We all rejoiced with them as well, when her results came back negative (or a 99% cancer free result)- meaning her body had accepted the new clean marrow and treated it as her own! Then this past weekend, after another routine checkup they found out that her cancer had come back. And that it's quickly spreading. Chemo can be done to help diffuse the spread a bit, but that was about it. If she lived for another year, they could try again with another bone marrow transplant. But really, that was all. I can't express the sadness this brings to us all. They gave her a few weeks to a few months left here on earth. God is good though- just days later, there's hope. A Dr at the #1 cancer center IN THE WORLD (one who is also very familiar with Stephanie's specific type of cancer) has agreed to see them! So will you please join us again in lifting up these friends, in prayer? The husband has specifically asked for prayer for insurance guidance, financial help, and that the necessary paperwork gets where it needs to go so they can get in :) We, of course also add to that prayer list that He does a miraculous healing in her body and that she becomes 100% cancer free and enters into remission! They have an appointment NEXT week and got the ok to fly to Texas to meet with this Dr! Please continue to lift them, the flight, the trip, and the meeting up in prayers! 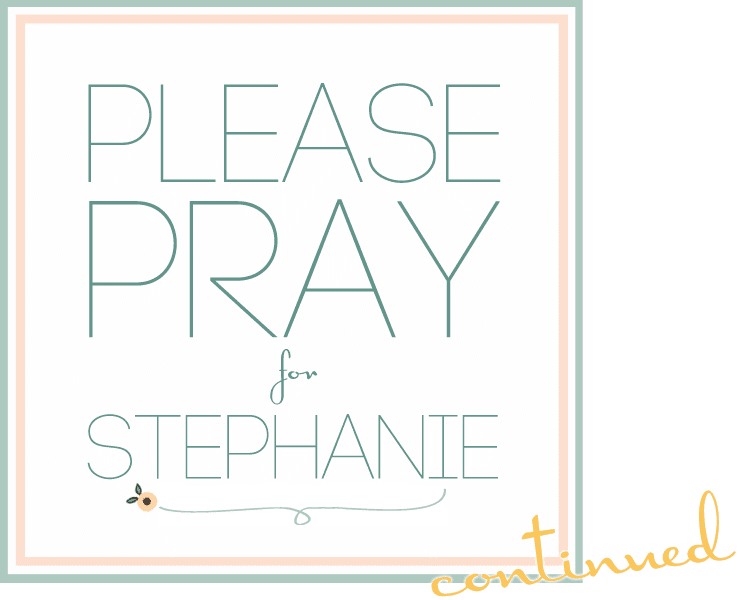 Especially Stephanie- praying she feels as good as possible. “Fear not, for I have redeemed you; I have called you by name, you are mine. When you pass through the waters, I will be with you; and through the rivers, they shall not overwhelm you; when you walk through fire you shall not be burned, and the flame shall not consume you." praying for healing, but also for peace and comfort for all involved. <3 The Lord is a gracious God, Let him pour his blessings over her and may she feel the overwhelming presence in this very scary time. Our family is praying! I was so heartbroken to hear this. I mean I don't even know her and my heart just breaks for her and her family. But I will pray for healing, peace, anything to make this situation better. Thank you so much for all of your prayers, friends! I woke up last night at 4 in the morning with Stephanie heavy on my heart. I decided to get up and pray. I pray that she would be able to get home one last time. I pray that a miracle might take place. Gosh, thank you so so much. His will be done.